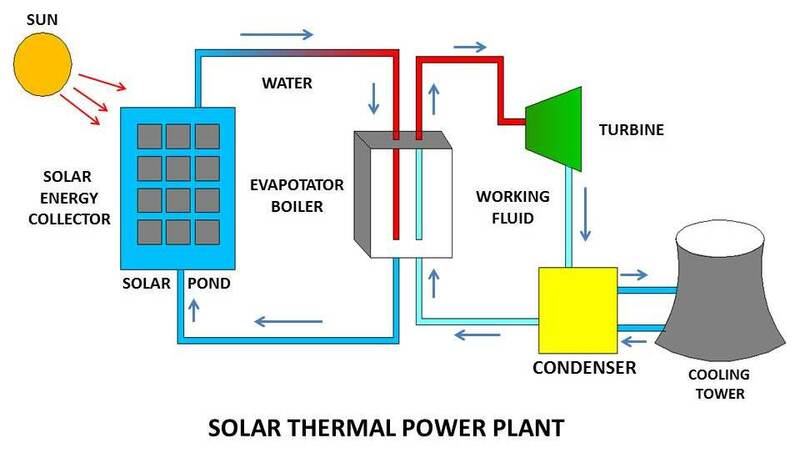 In this article we will discuss about the difference between solar and thermal power plant . 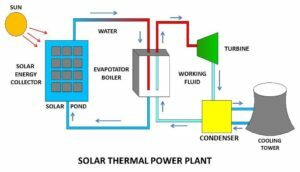 we will know in this article that what is measure difference between solar and thermal power plant. There are two types of technology for generating electricity from solar power – photo voltaic and solar-thermal. In solar thermal power plant , heat of sun is used for generating steam. When sunlight is comes to the water water gates evaporate into steam and this steam is further process forced on turbine and turbine starts rotate. By rotation of turbine electricity is generated. In photo voltaic technology sun rays are comes to the solar plate. SOLAR plate is made of certain types of semiconductors. These semiconductors generate electricity when sun rays comes to the solar plates. This is the most efficient and easy to use. This technology become very common these days. Thermal power plants are power stations which convert heat energy into electric energy. thermal power plants, the heat energy obtained from combustion of solid fuel (mostly coal) is used to convert water into steam, this steam is at high pressure and temperature. This steam is used to rotate the turbine blade turbine shaft is connected to the generator. The generator converts the kinetic energy of the turbine impeller into electric energy. Thermal power plant has many working steps to generate power. First required a fuel storage plant, it is use for store the coal for backup. Second is water treatment plant, it is use for take out of impurities from water so that plant systems are runs corrosion free. Then a main equipment is boiler which is use to convert steam from Water. And last is turbine which is use for generate electricity from kinetic energy created by steam. Sun rays is used as fuel. Mostly coal is used for fuel. Efficiency is less as compared. More efficient then solar plant. Low power can be generated Huge amount of power can be generated. Whether condition affects the power generation. Independent to whether condition. Required more land per megawatts power generation Required less land per megawatts power. Easy installation of plant. More complex installation. Hence these are basic difference between Solar and thermal power plat . if you will find any incorrect in above article you must comment box.